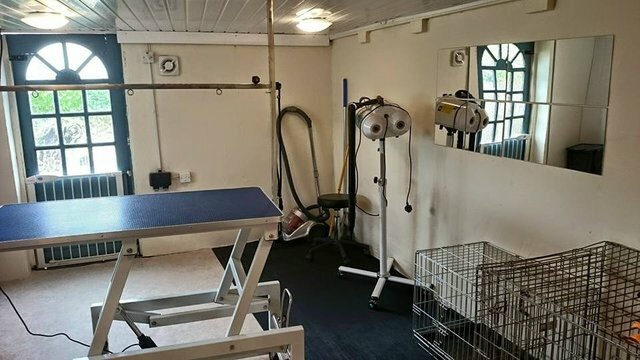 Mountain View Grooming is based at Kerry Lee Boarding Kennels & Cattery. We offer grooming for dogs whether they are staying with us, or just visiting for their groom. Nicola runs the Grooming studio and is also joint owner of the kennels and cattery along with Charles. We treat all dogs coming for grooming like ours – lots of fuss and talking to them to ensure they find the experience as relaxing as possible. Our appointment times are generous to ensure that your dog is not rushed through and is able to take a minimum of two comfort breaks during each groom. We have all new equipment including a low to high electric table so that dogs can hop on and off with ease. The table is one of the largest on the market so that even big dogs can feel comfortable. Our bath is stainless steel with a door and a ramp, again so dogs can walk in and out comfortably. We use WildWash shampoos and conditioners with Tropiclean SpaLavish facial scrub. The shampoos and conditioner are totally natural, British made and contain no parabens or synthetic fragrance.